We offer a unique chance to experience Yoga with Goats. Enjoy an hour of beginners Yoga classes,.. If you are an outdoor lover and can't get enough of hiking, exploring, and nature in general, you..
Family-Perfected Recipes At Tamale House East you will delight in an eclectic and delicious.. Delicious Mix of Vietnamese, Thai, and Chinese If you are hankering for something truly authentic,..
Rock Climbing Indoors on Austin North Side Main Event has a 9,000 square foot rock climbing area,..
We think you should give Lenoir a try. It’s a creative, French-influenced restaurant with a..
People don't go to Oasis on Lake Travis for the shopping experience alone, nor do people go here..
Come and satisfy your sweet-tooth! For some of the most delectable cakes, cookies, and cupcakes in..
Casa de Luz is a educational, non-profit community center that offers both yoga and health..
Ramen in Japan can be everything from a "fast food" to a highly sophisticated delicacy. Ramen..
A Downtown Coffeehouse Not to Miss If you're downtown in the Warehouse District you can't miss..
There’s hardly any food in the entire world that’s more flavorful than Indian food. With..
Austin, Texas offers wonderful opportunities for locals and visitors to savor the many delicate..
Buffets Can Be Top Quality Too Taj Indian Palace is as much known for its amazing Indian food as..
New to the Austin food scene is Twisted Root Burger Co., which has set up shop just outside the.. Upon entering the Taj Palace Indian Restaurant, you will have the pleasure of your nostrils being..
What makes Home Slice different from every other pizzeria? Try the largest slices of pizza you'll.. If you’ve been searching for the perfect place to drink a signature beer that’s brewed from..
Have you ever seen a "best I ever ate" segment on one of those food network shows? Well, dishes..
It’s a taco stand? It’s a deli? No, it’s tacodeli. Daily Taco Specials If you love tacos,..
Quality and taste! A cut above the rest! Those are just some of the terms that people use to.. Although not an actual cafeteria, Blue Star Cafeteria is great place to grab a bite and catch up.. The Commons Cafe, which is located in the Commons building and the University of Texas, is one of..
Late in 2009, at a time when everyone else was gearing up for the Christmas season, a pair of.. The Celia Jacobs Cheesecake Experience has created the combination of two of the best things in the..
For some of the best barbeque in Austin, you have to check out Micklethwait Craft Meats on Rosewood..
A Homey Neighborhood Cajun Cafe Don't expect anything fancy at this one-woman Cajun cafe in the..
Delis are usually great for sampling a lot of flavors from different parts of the world in a very.. The Mohawk is known for quality rock shows which are diverse yet artfully selected. The list of..
School House Pub is one of the coolest places in Austin for locals to gather on the weekend to.. Weather Up Austin offers something a little bit upscale yet delightfully comfortable on the city's..
Austin has a lot of bars and a lot of dancing, but there is a particular kind of place that people.. The story of Hanovers’ family business started out in the heart of downtown Pflugerville, Texas..
Phara's is the kind of place you go to when you want to camp out for the evening. Shop for a bottle..
What is Karaoke? In Japan, Karaoke means empty orchestra. "Kara" means empty and "oke"..
Our first inclination to try this place comes from the name, which sounds mysterious, flirtatious,..
Set back within the now hip Manor Road area you will find the The Vortex Repertory Company, a..
Cain & Abel's is an Austin college staple for a reason. It's welcoming and affordable, and even.. The Tavern is a guaranteed great place to go during sporting events to catch the game and to eat.. Looking for a true dance club in Austin? Barcelona's basement nightclub, known to some as the "bass..
Let's face it, the food scene is hectic and time-consuming. Being a cook has to be one of the.. 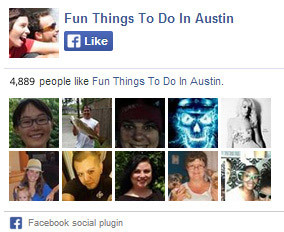 Plush is known to some as the "512 DJ Mecca," a place where Austin DJs and their mixes thrive, and.. The Red Shed Tavern is the perfect far South Austin place for those Free Birds out there, bikers..
BD Riley's is more than just a pub, it's its own family, and they reward customer loyalty unlike..
You've seen the PubCrawler all around Austn. You've likely honked or called out to the people.. Location: 507 Calles, Austin, TX 78702 Tap Room Hours:: Monday to Sunday, 10AM to 10PM.. The Broken Spoke is a "true Texas Honky-Tonk" in Austin, Texas, and has been a cornerstone for..
You'll definitely want to stumble upon spending a few hours hanging out at Dirty Bills. As many..
Where can you combine dinosaurs, nature trails, rope courses, boating and an extensive wildlife.. Paint Masterpieces with No Experience Required. You splash on some paint, take a sip, and admire.. It's Bouncy Indoor Fun Jumpstreet has something for everyone. You can bring kids as young as 3..
Wanna dress up as a Spaceman for HAlloween, or a naughty shark for Mardi Gras, or a Lady Gaga with.. The Cathedral of Junk stoically stands within the backyard of a quaint suburban house on the.. It's a Blast There are certain things that bring an uncontrollable grin to anyone's face. ..